Plate 140, Software algorithmic reverb from Universal Audio in the UAD Plug-In series. The Universal Audio Plate 140 is a software plug-in emulation of the classic EMT 140 plate reverbs. I had no compatibility issues at all and it has always run smoothly and stably within my set up. The interface of the plug-in is pretty easy to follow - it has three different types of plates to choose from, with parameters for pre delay, width, and wet mix to control the plate reverb. It also has a two band EQ section for lo frequency and hi frequency. Everything is laid out conveniently and is easy to find. I don't have the manual for the Universal Audio Plate 140, but it is easy enough to use that you don't really need it if you don't already have one. I am currently running the Universal Audio Plate 140 on a Mac Book Pro that has a 2.2 Ghz Intel Core 2 Duo processor and 4 GB of RAM. I run the plug-in in Pro Tools LE 7.4 that runs off of a Digi 002 R audio interface. Within this configuration I haven't had any issues running this plug-in. However, I've never had more than a few of these going at once because I put it on an auxiliary track and send other tracks to and from the aux track. This saves CPU power and allows me to have reverb on as many things as I want without having a separate plug-in on each of the tracks. For this reason I don't really know how well it would stand if you put up a lot of these at once, but it is kind of unnecessary to do so. 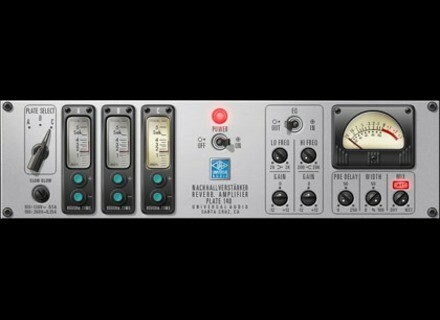 I've been using the Universal Audio Plate 140 plug-in for about two years and have found it to be a great emulation of a real EMT 140 plate reverb. The price is quite cheap, and it is extremely easy to use. I have come to trust Universal Audio hardware and software, and this plug-in is no exception. While nothing can sound as great as a real 140, the Universal Audio Plate 140 plug-in is a great substitution. for those who don't have access to a real 140. It takes the resource, for sure: about 25% of the power of a single card UAD-1! But as soon as we know it, you know right away why! It is therefore the emulation of the EMT 140 plate reverb ("Plate reverb"). Let's cut to the chase: SOUND! I tried many software reverbs flat so far. None of these (sometimes very very good) emulations can compete with the Plate 140! It is best to see the demo on the site of UA, you will hear why! It really is THE SOUND of reverb 70's high bill. Today, a plate reverb is "Vintage", it should sound oldie, but some publishers exaggerate the dirty side of her! But it must be said that at the time it was made to sound as natural as possible! That's the AU force, they do not exaggerate! It sounds very much like the original, while net warm and surout not metal!